Neil Gaiman's Journal: Being Alive. Mostly about Diana. Being Alive. Mostly about Diana. I'm in the UK right now, in the middle of nowhere, working on Monkey, about to go offline for a few days. I came over to do three things: to give the BBC a day to promote Episode Four of the next season of Doctor Who, which I have written; to see Hilary Bevan Jones, a wonderful producer with whom I've been working for years, about a couple of things; and to see Diana Wynne Jones. Them: "So, can you tell us the title of the episode?" It was a fun but sometimes frustrating day. Diana's been my friend since about 1985, but I was a fan of hers since I read Charmed Life in about 1978, aged 17. I've loved being her friend, and I'm pretty sure she loved being my friend. She was the funniest, wisest, fiercest, sharpest person I've known, a witchy and wonderful woman, intensely practical, filled with opinions, who wrote the best books about magic, who wrote the finest and most perceptive letters, who hated the telephone but would still talk to me on it if I called, albeit, always, nervously, as if she expected the phone she was holding to explode. She adopted me when I was a 24 year old writer for magazines of dubious respectability, and spent the next 25 years being proud of me as I made art that she liked (and, sometimes, I didn't. She'd tell me what she thought, and her opinions and criticism were brilliant and precise and honest, and if she said "Yee-ees. I thought you made a bit of a mess of that one," then I probably had, so when she really liked something it meant the world to me). As an author she was astonishing. The most astonishing thing was the ease with which she'd do things (which may be the kind of thing that impresses other writers more than it does the public, who take it for granted that all writer are magicians.But those of us who write for a living know how hard it is to do what she did). The honest, often prickly characters, the inspired, often unlikely plots, the jaw-dropping resolutions. She dedicated her book Hexwood to me, telling me that it was inspired by something that I'd once said about the interior size of British Woods, and I wrote a doggerel poem to thank her. I crop up, in semi-fictionalised form, in a book by Diana -- Deep Secret -- and she told me once that the young Chrestomanci in The Lives of Christopher Chant was sort of based on me too. I'm proud of both of those things, even if it does mean that people who have read Deep Secret sometimes ask whether I really ate two breakfasts while mostly asleep, and I tell them that yes, I did. So. Diana, who smoked (with joy and delight and enthusiasm) got lung cancer. And so each time I would come to the UK, I'd go and have dinner with her and her husband John, and the dinner would be cooked and accompanied by Dave Devereux, who has been helping them, and somewhere in there I would see our mutual friend Tom Abba, as well. Each time, I'd take a few minutes at the end and I'd make sure that I'd said to Diana anything I wanted to be sure that I'd said, because I knew I might not see her again, and unsaid things are the hardest. I'd planned to see her yesterday, Saturday, to go down to Bristol with my daughter Holly. But on Friday morning I got a call from Dave Devereux telling me that it was time and I should come now. I called Hilary Bevan Jones, apologised (she was very understanding, as were the other people I was meant to see), and I went to Bristol. I wrote a letter that night to a friend. I'll quote it here, if you don't mind. She's at a hospice. It's beautiful there, and the staff were wonderful - helpful and nice and you never felt like you were bothering them, as one does at so many institutions. I saw the family outside. They warned me that Diana was very frail and changed. She was on morphine, breathing heavy and hard, as if she was fighting for every breath, and I sat by her bedside. I thought about the phrase "your last breath..." as every breath felt like it could be final. But she kept breathing. I told her you said goodbye. Her hair was whiter and she seemed thinner, but not really changed. but it seemed less like someone was actually there -- as if there was a distance between the person I'd known and the body breathing in the bed. Less of a distance than with a body -- but there was a sense that felt like a certainty that she wasn't going to open her eyes and talk again. This sleep was final, and soon the breathing would stop. I went out and sat in the waiting room with Tom Abba, and we talked about Diana, and we both cried a bit. Then I went back in with Tom and we sat some more. I thought about Dogsbody, which I have to write an introduction to, and wondered what star Diana would be, if she was a star. Then I went out, and Mickey, her son, went in and sat with her, and I talked to the family. I met Diana's sisters for the first time, although I had heard much about them. I spent the rest of the day with the family, with John and Diana's sister Isobel and Mickey (with whom I'd shared a room at World Fantasy Con in 1988), and we had a Bristolian Chinese meal, and talked about lots of things. 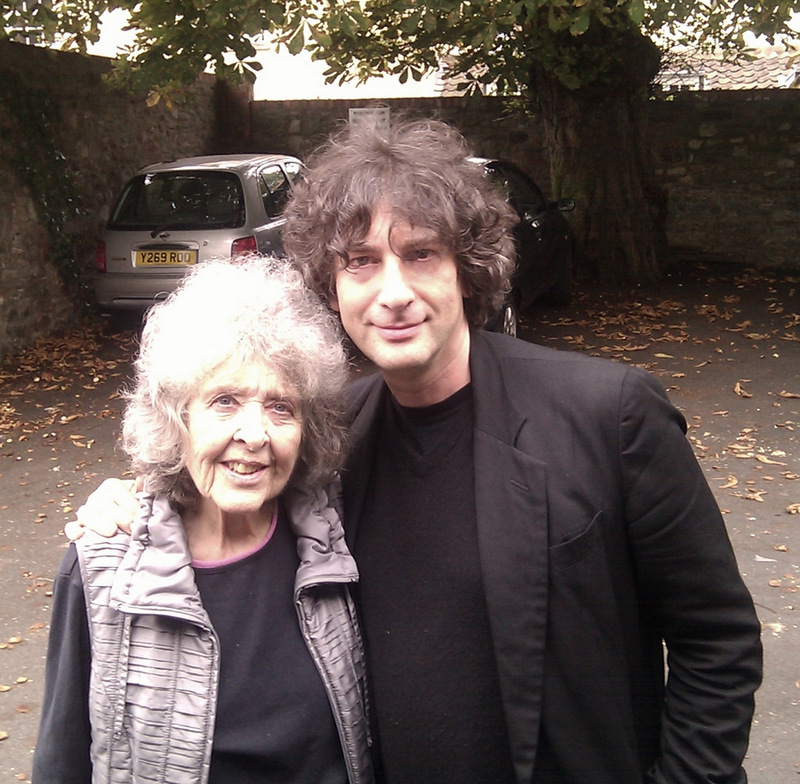 And I told John I'd come and see him whenever I come to Bristol, and I shall. It's hard. But I am glad I did it, and they said that Diana was pleased that I was coming, and perhaps somehow she heard me and knew I was there. I stayed up late that night until I could talk to Amanda back in Boston about what had happened that day, and once I had talked to her I felt better. 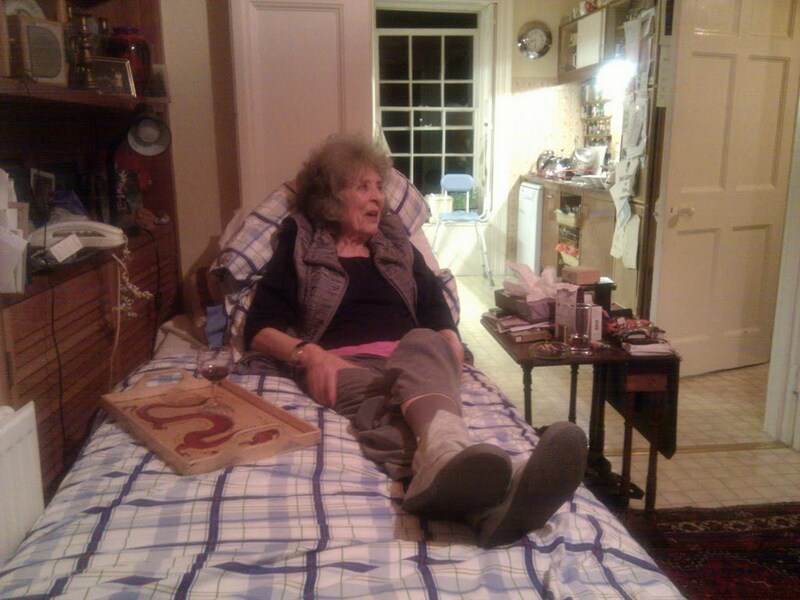 In the morning I was woken by a phone call from Dave, telling me that Diana had passed away in the night. The news was out -- someone had already changed her Wikipedia page to give it a date of death. Rest in Peace, Diana Wynne Jones. You shone like a star. 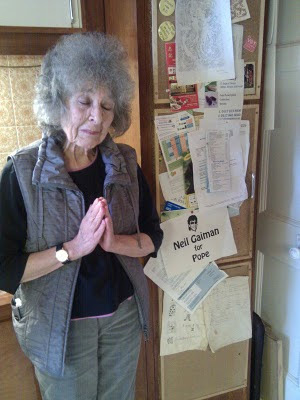 The funniest, wisest writer & the finest friend. I miss you. I felt sad, but also felt lucky. Lucky that I'd known her, lucky that I'd gone and said goodbye on the Friday and not tried to wait until the Saturday. Lucky to have had a friend like that. I do miss her, very much. I have some wonderful friends. I have people in my life who are brilliant, and people who are colourful, and people who are absolutely wonderful, and who make the world better for their being in it. 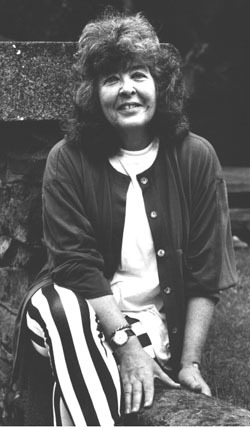 But there was only one Diana Wynne Jones, and the world was a finer one for having her in it.